Snapdeal is India’s yet another e-commerce company which was founded by Kunal Bahl and Rohit Bansal on 14th February 2010. Within the time span of 5 years, Snapdeal became one of the largest online market place in India. Snapdeal also acquired Freecharge (online recharge / bill payment company) on 8 April 2015 for Rs 2800 Crore. Now, you can also recharge your mobile or pay your bills through using your Snapdeal account. 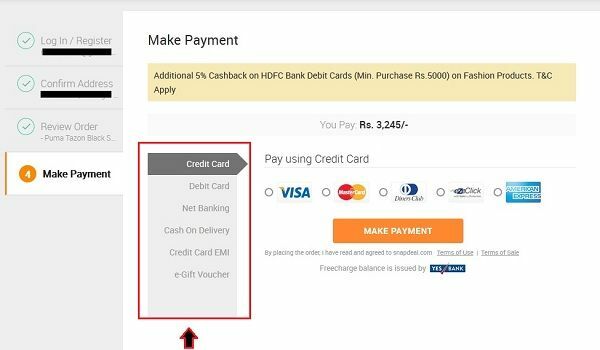 Just have a glance at this article to know how to buy things from snapdeal. Step 2: In the next step, you need to enter your email address with your snapdeal password in order to login to your Snapdeal account. Step 3: Now, search the product that you want to buy, Snapdeal contains a large variety of products in different categories. For demonstration purpose we are choosing Puma Sports shoes. Before buying any products online, it is always recommended to review the product and then click on “Buy Now” button. You can also select “Add to cart” option, if you want to buy your product later. Step 4: In the next step, you need to review your order, which includes your order quantity, Delivery options and order subtotal. 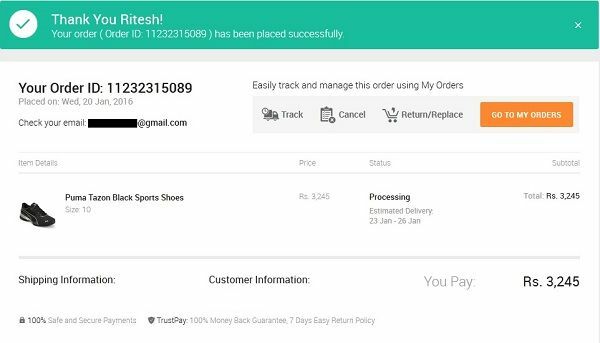 After reviewing your details thoroughly, just click on “Proceed to payment” button. Step 5: In the next step, you need to select your payment option. Here, you may see different payment options like Credit card, Debit card, Net Banking, Cash on delivery, EMI, etc. 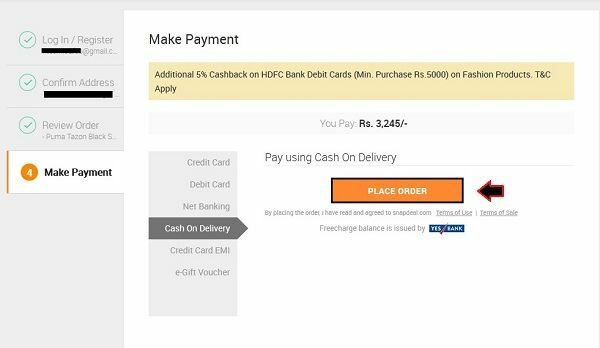 Step 6: Here, we are selecting cash on delivery option as you can see in the image below. Now, what you need to do is to just click on the “Place Order” button. Step 7: Finally, you may see a message saying “Thank You, your order (Order_id) has been placed successfully”.